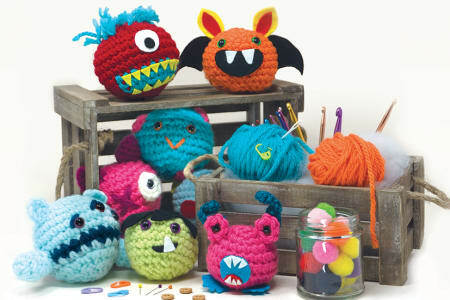 The Hook A Monster team are three friends with a passion for crochet. Viv, Mya and Mel have years of experience making toys, creating their own designs and writing patterns. They have created a relaxed and friendly workshop to let your playful spirit flourish. Viv learnt to crochet from her mum 5 years ago. She has been living in a mountain of wool ever since and keeps buying more! Viv works with Mya to make lots of soft, crochet toys which they sell on their online Etsy shop BearsInHoodies. Mel started off her crocheting career 12 years ago when she decided that learning to crochet was far more exciting than revising for exams. When Mel's not climbing mountains of wool with Viv and Mya, she is busy developing her own line of cute, crocheted critters called BumbleDinks which you can follow on Instagram. Excellent teachers. Friendly, patient and so positive with those who straggle-struggled behind. Very attentive and helpful at every step.SUCH a fun experience, such good value for money....even for absolute beginners like me and my Mum. We had never crocheted before....and at the end we all took a photo of all the baby monsters we'd made in such a short space of time...!Highly recommend! We (my daughter and I) absolutely loved this class! Mya was so helpful and patient with us. She really went above and beyond to provide a quality experience! I would HIGHLY recommend this class to anyone who wants to learn how to crochet, and the adorable monsters you make and take home are amazing! Really fun class! Everyone went home with a wonderful little monster and skills to make a friend for it when they get home!Informative, fun, colourful, creative and the tutors were wonderful! Thanks! Viv and Mya were great and fun. Having not managed to have much luck learning from YouTube I’m really glad I took a class with them to kick start crochet life! This was fun and relaxing - just tricky enough to be fun, but not frustrating at all. I love the monster I made. Viv and Mya were so lovely and encouraging, it was a fantastic way to spend a rainy afternoon. The workshop was simply superb. It couldn't have been anymore fun, so many laughs and you get something excellent to take away at the end of three hours too. We wanted to carry on al day and can't wait to go back again. It was excellent and would recommend everyone to give it a go! This was a really excellent introduction to crochet. Mya, Viv and Mel were all great teachers and the pace of the class was perfect for people who no crochet experience. I cannot recommend this class more strongly!! Absolutely fantastic, loved every minute! It was great to learn new skills and make something more original. The class was well taught, the ladies were lovely and fun. I’ve already started making my next monster! I can't believe I crocheted a monster! Amazing (and very patient) teachers guided me through my first amigurumi experience. I would highly recommend for anyone looking for a new hobby, a fun day out or indeed a monster for their mantlepiece! This was a really great class. 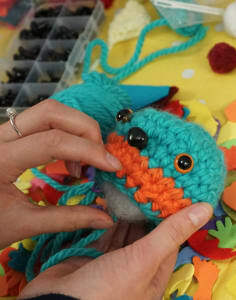 Viv, Mya and Mel make a brilliant team - they are really hands-on and super keen to help you crochet the best little monster you can. I really liked how much attention they gave to everyone, and the really helpful diagram booklet that came with the class. My favourite bit was at the end - adding bits and bobs to make my little monster really unique. I felt like I came away with not just a new woolly monster, but also a new skill. Thanks guys! I had never done crochet before. I learned that it was therapeutic, highly enjoyable, and a skill that you can keep building. Plus, the monsters that we made were super cute!I cannot speak more highly of Viv, Mya and Mel. Viv was my tutor for the session, and she had endless patience and an unwavering smile. I will definitely be going back!If you enjoy learning new skills with friendly people while drinking tea, this is for you.Thank you, Hook a Monster! I learnt how to crochet a basic shape of the toy and then had fun created a monster appearance with cut up felt and bead. You really had to let your imagination run wild to create a scary one. The teachers were very friendly and great at showing us what to do. The venue was bright and pleasant. I had the most enjoyable time there. Wonderful way to spend an afternoon- relaxed but encouraging, learnt loads and had fun. From near total beginner to actually making a monster in 3 hours. Highly recommended. A great new way to learn Crochet I didn't realise there was other ways, at first it looked very difficult but the to ladies where very helpful, once I got started I didn't want to stop I also bough the kit. A great course with great teachers! Not only did I learn how to crochet from a pattern but I came home with a cute amigurumi monster. I'm officially hocked on crocheting now! Really fun course and came away with a not only knowledge to go forward and start up further crochet projects, but my own little monster I had made on the day. Would certainly recommend to others. I took my sister to this workshop as a Christmas gift and it was absolutely worth it! It was a great environment and the ladies were lovely, sharing great tips and helping us to create a finished amigurumi character. The best part about this workshop (aside from the wonderful people) is that I now feel confident to approach more ambitious projects as I have the key skills I need. Thank you for the great afternoon - highly recommended!